The sweet people at Carson Dellosa recently sent me a box of Guided Reading materials to review- and I seriously felt like I hit a jackpot at the perfect time! I got these four Guided Reading Books that have pull apart books for small group time. Let’s be honest- It’s the end of the year and I am ALL ABOUT using anything that takes zero amount of time to prep! And, these were as simple as tearing the books out and folding them down the middle. We did some teeth/dental health type stuff last week so this particular set about Caring for your Teeth fit in perfect. I only used these with my highest group of first graders. You get 6 copies of each reader and they come all ready laminated super thick! They were a perfect addition to our reading block time and we had tons of info to talk about and discuss with these little readers. I would really recommend checking these out. Here is a website link if you want to read more about them.. I participate in the Brand Ambassador Program for Carson-Dellosa and have received these products free to review. We have a great art teacher and program in my little school- and we had our annual art show this week. These were school, district and state winning art pieces. This is only a small sample of some of the artwork that was on display. I really don’t know how we could be at the end of the school year. This picture was taken earlier this week- we only have 14 days left now. 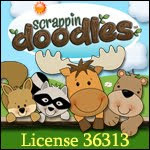 I added a new collection of folded note cards to my Doodle Bugs Paper website this week. Have these Fidget Spinners taken over your school. They only get to come out during recess time in my class. They cause WAY to much distraction. This is one fad I am ready to see disappear! How do you feel about them? I want to make the photo magnets for Mother's Day from your May 10,2013 blog post. How did you print your pictures small enough to fit on a small tile? I have checked at my local Walgrens and they don't make prints that small. Did you print them yourself on your printer? And if so, how did you get them small? Thank you so much for your help!!!!!!!! Thanks for setting up the linky. A boy was playing with one of those spinners at church. It drove me crazy. Your new line of cards are fantastic. Love them. I had a student bring a fidget spinner, and another student in my class stole it and lied vehemently about it. Now I've banned them. However, one of my "reporters" informed me as she was leaving for her bus that a student had one in his pocket all day Thursday! Ugh. In a nutshell, I'm not a fan of fidget spinners!